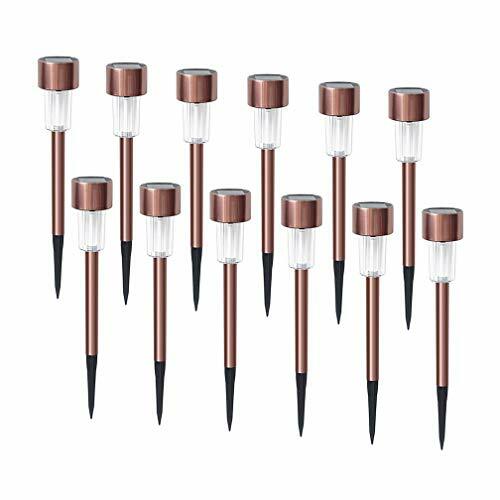 Ideal decorative lights for outdoor,as well as gift-giving.Warm white LED lights help you to decorate patio, garden, porch, yard path and walkways.12 pack cast enough light to brighten your path, enhancing both visibility and safety. ·Sensor unit,the solar lights will turn on automatically at night and turn off at dawn. 1. Please remove the insulator in the battery case before use. 2. The spike are hidden inside of the metal tube,please pull it out for the first time use. 3. Solar lights need to keep away from the shading area,operating time will vary by specific location,daily weather conditions,and season. 4.If the soil in your garden is quite solid, we recommended that you should make a hole on the ground or wet the soil first before inserting the spike. Stable anti-corrosion: The case of solar garden light is made by high quality stainless steel,realized by copper electrophoretic deposition with stable anti-corrosion and perfect appearance, better to reflect the owner' s pursuit of quality of life. ECO-FRIENDLY: Runs completely on solar power, No wires! No Tools! Simply remove the insulation under solar cap and install it where comes sunshine and enjoy the warm white pathway lights about 8hrs after full charged. WEATHER RESISTANCE: IP44 waterproof design protects light from the snow and rain,ensure these solar yard lights keep working for long-term outdoor using. WIDELY USED: Ideal decorative lights for outdoor, as well as gift-giving. Warm white LED lights help you to decorate patio, garden, porch, yard path and walkways.12 pack cast enough light to brighten your path, enhancing both visibility and safety.